At Smile Essential, we are delighted to offer the latest facial rejuvenation treatments, including dermal fillers, under the care of fully-qualified, highly experienced practitioner Lina Kotecha. These treatments can make you look and feel years younger, softening lines and wrinkles and rehydrating the skin. Lina qualified as a dentist in 2000 and developed a special interest in facial aesthetics, undertaking a host of further qualifications in Dermal Fillers and Wrinkle Softening treatments. Lina prides herself on her extensive qualifications and training achievements. She keeps abreast of all the latest techniques in facial aesthetics by attending regular meetings, conferences and training. She has completed a Masterclass in Facial Aesthetics run by the Faculty of General Dental Practitioner in 2015. Lina prides herself on her extensive qualifications and training achievements in facial rejuvenation treatments. A detailed list of Lina's training and qualifications are below, categorised into her facial aesthetic career. Dermal fillers are made of Hyaluronic Acid, which occurs naturally in the human body, especially in the skin. It’s essential for water retention, wound healing and tissue repair, and is one of the main components responsible for that plump, smooth, youthful look in young skin. Our dermal fillers start working instantly, and the effect will last between six and 18 months. The fillers include a local anaesthetic, but additional local anaesthetic will be given before treatment to ensure the procedure is entirely pain-free. Lina uses only the latest techniques to administer treatment. Dermal fillers are very safe and suitable for most patients. However, if you are pregnant or breastfeeding, or are susceptible to keloid scarring, this treatment should be avoided. In addition some medications may mean you are unsuitable for treatment, which is why we take a full medical and drug history as part of your assessment appointment to ensure that treatment is safe for you. 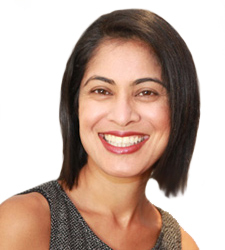 To book a consultation with Dr Lina Kotecha, contact the practice today. The dermal filler treatment provided by Dr Lina Kotecha enabled me to do something about the wrinkles and not let them determine how I feel.